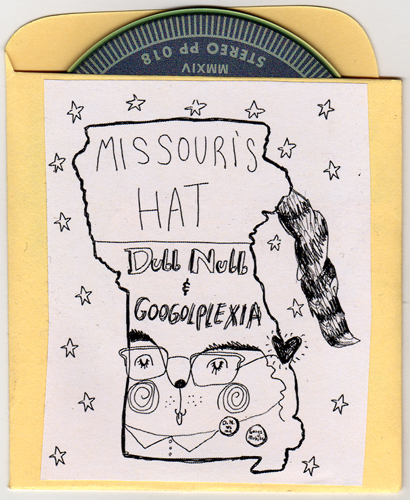 Dubb Nubb and Googolplexia each recorded a new original and a cover of a song by the other. Missouri's Hat, named for the tour through Iowa (and beyond) on which they went together upon its release, is the result. 'Twas officially released (and the eponymous tour kicked-off) 22 March MMXIV at The Livery Co.
Dubb Nubb - "Alone At The Same Time"
Dubb Nubb - "Chopping Up Onions"
Googolplexia - "Mound City Baby"
Get this miniature CD split EP by mail-order: just click the mini-version of the artwork below! It costs $4.50 postage paid. Someday I'll set up the mail-order part of PancakeProductions.net to be all fancy and allow for creating a proper shopping cart, but for now I'm too stupid, so you just gotta buy stuff piecemeal, as it were. NOTE TO INTERNATIONAL FRIENDS: Shipping will cost more for you, depending on where you are. E-Mail for information on how much that is likely to be, or just order the record as usual and we can talk about it between then and when I send 'er out! Artwork was provided by Delia Rainey of Dubb Nubb. This is a co-release not only between Dubb Nubb and Googolplexia, but also between Pancake Productions and Special Passenger Records (Dubb Nubb's Amanda Rainey's label). More or less this same image was used for our tour T-Shirts and tour posters as well. In fact, we still have a few of said T-Shirts and posters, and if you are interested in either, let's talk about that. The packaging is made from library-card sleeves. Downloads are included with purchase. Feel free and encouraged to color your copy whatever color you want with crayons, markers, or beyond! This we failed to encourage people to do (mostly by our lack of crayons) while on tour. Oh yeah, and we only made 200 of these, so get' em while ya can, and then they're GONE FOREVER (but probably will be on BandCamp or somesuch someday).